This MySQL for Visual Studio feature enables you to configure the Membership, Role, feature enables you to configure the Entity Framework, Membership, Role, Site Map, Personalization, Session State, and Profile Provider options without editing the configuration files. You set your configuration options within the tool, and the tool modifies your web.config file accordingly. Site Map and Personalization provider support requires MySQL Connector/NET 6.9.2 or higher and MySQL for Visual Studio 1.2.1 or higher. 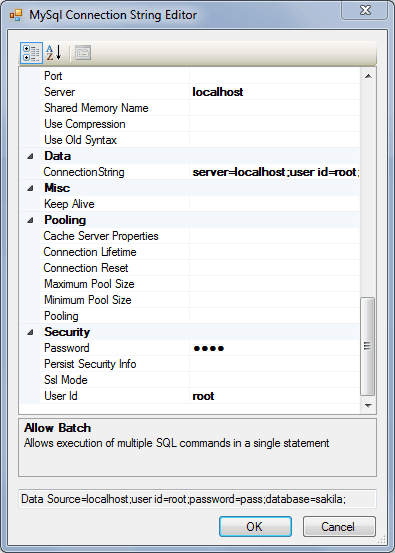 The MySQL Website Configuration Tool appears as a small icon on the Solution Explorer toolbar in Visual Studio, as shown in the following figure. The MySQL Website Configuration Tool icon is only visible if a MySQL project is active and if Connector/NET is installed. Clicking the Website Configuration Tool icon launches the wizard and displays the first step (Entity Framework), as the figure that follows shows. This allows you to configure your application to use Entity Framework 5 or 6 with MySQL as the database provider, adding the required references to the project and updating the configuration file accordingly. By clicking next, the next screen will allow you to enable a MySQL Membership Provider. In addition to the standard (advanced) "Membership" provider, there is also a "Simple Membership" provider. You can only choose one of these two membership providers. To use the more advanced "Membership" provider, select the "Use MySQL to manage my membership records check box to enable this. You can now enter the name of the application that you are creating the configuration for. You can also enter a description for the application. Defined connection strings are automatically loaded and available in this dialog, whether they were created manually in web.config or previously using this tool. You can also ensure that the necessary schemas are created automatically for you by selecting the Autogenerate Schema check box. These schemas are used to store membership information. The database used to storage is the one specified in the connection string. You can also ensure that exceptions generated by the application will be written to the Windows event log by selecting the Write exceptions to event log check box. Clicking the Advanced button launches a dialog that enables you to set Membership Options. These options dictate such variables as password length required when a user signs up, whether the password is encrypted and whether the user can reset their password or not. The "Simple Membership" provider is similar to the advanced version, but it includes less options. To enable, check the "Use MySQL to manage my simple membership records" check box. The "Simple Membership" option was added in MySQL for Visual Studio version 1.2.3. The MySQL Simple Membership provider handles the website membership tasks with ASP.NET. This provider is a simpler version of the ASP.NET Membership provider, and it can also work with OAuth Authentication. For additional information about using OAuth authentication, see Adding OAuth Authentication to a Project. The required configuration options for the Simple Membership provider are: a name for the connection string, and a connection string that contains a valid database with a local or remote MySQL server instance, a user table to store the credentials, and column names for the User ID and User Name columns. Check the Auto Create Tables option to create the required tables when adding the first user to the table. After setting up a membership provider, a new section is added to the web configuration file. After setting up a membership provider, a new section is added to the web configuration file. This screen display similar options to the previous screens. The Site Map provider builds a site map from a MySQL database, and builds a complete tree of the SitemapNode objects. It also provides methods so that the generated nodes can be read from the site map. The required configuration options: A name for the connection string, and a connection string that contains a valid database with a local or remote MySQL server instance. After setting up the Site Map provider, a new section is added to the web configuration file. The Web Personalization provider is used when a website application needs to store persistent information for the content and layout of the Web Parts pages that are generated by a Web Parts personalization service. This provider should be used along with the Membership, Roles, and Profiles providers. After setting up the Personalization provider, a new section is added to the web configuration file. Once you have set up the optional Web Personalization options, click Finish to exit the wizard.